I’m still reading Sarum, by Edward Rutherford, although I am nearing the end. I am still thinking back to a fictional character – I think she is fictional because when I Google’d her name, I got the name of an English queen, but not this particular Aelfgifu. In Sarum, Aelfgifu is a warrior woman. As a young girl, she hangs out with all the guys, rides with them, hunts with them, and is accepted by them. When the Vikings raid, she fights them. The Vikings are astounded, and more than a little angry, to be fought – successfully – by a woman. Later, her father reluctantly allows her to ride with the men to counter another Viking raid – they need all the “men” they can get, and she is one of the best. It was hard to find a good warrior women illustration which had women with their clothes on. Most of the illustrator, I guess, being men, they protray women warriors in scanty attire, and most of them have exaggerated breasts and hips, and tiny little wasp waists, and legs about twice as long as a normal woman. Sort of Barbie-doll in warrior women attire. *she snorts in disgust* Leaves a fighter a little vulnerable, don’t you think, fighting in a metal bra and tiny little loincloth? That metal would get uncomfortable in no time, and man, how can you ride a horse for very long without chafing your legs? But then reality wouldn’t sell the drawing, would it? OK, OK, back to the real question – Warrior women pop up in all cultures. I think that is true, but when I think of the Arabian Gulf, or Persia, or the Levant, no one comes to mind, other than Sheherezad, but she triumphed by her wits, not her brawn, not her fighting skills. I remember hearing that nomadic women could be fierce; are there not legends of Bedouin women? Is there a woman / are there women who were legendary fighters in Middle East culture? Are there women in Persian culture who fought, or held a castle, or were otherwise brave in the face of danger? Speak now! There were so many women and princess warriors in the Levant and Arabia. Arabian women warriors flourished before and after Islam. Some major Islamic battles were led by women. I know there are more. Especially in Jahliyyah (pre-islamic) Arabia and Levant. Holy Smokes, Kinano, how could I forget about Zenobia????? And I love all the others, lots of names to look up. Very cool, thank you! One of the most distinguished women who took part in the battle of Uhud was Nusaybah bint Ka’b al-Maziniyyah (May Allah be pleased with her). She was known as Um’Umarah. It was at this moment when Nusaybah went forward, with her sword unsheathed and her bow in her hand, to join the small group of archers as they were standing firm with Rasulullah [sallallahu alayhi wa sallam], acting as a human shield to protect him from the arrows of the idolaters. Every time danger approached Rasulullah [sallallahu alayhi wa sallam] she was there to protect him. It starts of with a story about Kuwait’s occupation and then goes into detail about women’s experiences in war throughout time! Such an interesting read. N. You are welcome to make long comments, and most certainly when they contain so much good information. I love your example. I love it. Wow. I was thinking history, but not modern history. That second article is not an easy read – the content is difficult, brutal – but solid gold, too. Magical – love the image – the armor looks usable, but the arms still look very vulnerable! Forzaq8 – WOW. What legendary heroism! That is a great read, and thank you for looking it up and posting it here. I would name my daughter Khawla! both modest AND brave! I am an Iranian and I know that persia had many female generals and building engineers, but dont how any names right now. What I wanted to say that in your post you have used the incorrect term “arabian gulf”. The official and right term was, is and will always be “persian gulf”. Dariush – 😉 You know, no matter what I say, I am in a box here – I am going to offend someone! I just love that this topic was written by so many knowledgable people, and it continues to be one of my most popular posts ever, week after week. I think some people are using it as a jumping off post for papers. Woooo HOOOOOO! Great topic, and so much I didn’t know! Hi intlxpatr. I am happy that your post has become so popular. But still, I don’t think writing the right name of the gulf would be offending to anyone, and if it is, that one has got a problem. You can check the net and see that I am right about the real name being the persian gulf. But afterall, this is your page, so you can write whatever you want. It is up to you. PS: I have got nothing against arabs. I just don’t understand pan-arabism. Dariush – if I were living in Iran, I would probably call it the Persian Gulf. In the Gulf countries, it is always called the Arab Gulf. Go figure! It is not in all gulf countries they call it the arab gulf, in Iran which is a gulf country it is called the persian gulf, plus all over the world it is called the persian gulf. And even if you live in an arab country you don’y have to call it by its wrong name, unless you want to yourself. OK! OK! Darius, Persian Gulf! Persian Gulf! Hi, I want to say something already stated here: There was a large quantity of warrior women in Persia, particularly during the pre-islamic period. Among the Achaemenids, Artemisia comes to my mind. Later, the Sassanid era left space for many women to take an important role in the army, being regular soldiers, knights, even generals and governesses. Some Roman sources described the Persian side of the battlefields after a fight, full of courpses of men and women equally, and that intriged them greatly. I can’t think of specific names right now, but works like the Shahnameh may show you some examples. Welcome, Perszeusz – This has been one of my (unexpectedly) most popular posts. I think a lot of people come here looking for material for papers – and you have just helped them! Thank you! Arabian Gulf is another name for the Red Sea, and I believe that’s not what you were referring to. How typical to turn a very interesting post – which poses very interesting queries- into an inane remarks about the name of a once bountiful body of water. As far as I’m concerned, this is an example of the avaricious, narrow-minded thought processes of some people living in this part of the world. The post asks for information about legendary Near Eastern women warriors which includes Arab countries and Iran. Yeh, you are right! Open minded people call each other ignoring the original names, Jewaitala. Let’s face it, you can not look for historical facts like great women of our history, if you ignore the facts about great geographical entities of our region. Arabs are part of the Semite race, and the Semite race was a really great one at times of the Babylonians. Babylonians had access to the Mediterranean sea but not any other big body of water, except perhaps a small area where Tigris and Euphrates joined each other and reached the sea, and that was only at the time when Babylonians destryed Susa which was not far away from the sea then. At the time of Babylonian glory, no other Semites are traced in history. Contemporary to Babylonians, you’ll find the Elamite and Jiroft civilizations. They were the two nations living all along the Northern shores of the Persian Gulf and partially on the southern side. Later Elamites and Persians joined together and they called the sea Persian Gulf. I wonder if anyone can show a map more than 50 years old which would show Persian Gulf as named by any other name. Again, if you want to ignore history, please, shoot, but this is how we people of this region forget about what we were and what we are, and this is why we tend to forget that whatever will happen in this region, we will all be in it together. dud its Persian Gulph. please correct your self. Modern day air warriors in the Muslim world: The Pakistan Air Force is one of the few nations in the world to have female fighter pilots in its ranks. There are several female fighter pilots in service and more will be operational soon. A photo of two female fighter pilots serving the Pakistan Air Force. Forgot to mention that recently Pakistan began to recruit women for combat positions and the Elite Anti-Terrorist Force recently graduated women candidates to be Sky Marshals for Pakistan-based airlines. Pakistan is also the only Muslim country to have women Major Generals in the Army. I love this post. Almost a year later, it is still attracting comments that teach the rest of us something. Sam, thank you. I had NO idea there were female fighter pilots in ANY military. Way-to-go, Pakistan. I love the photo, Sam, it makes me want to cry. One fighter pilot in hijab, one without. Beautiful. You can read more about it at the original source at Spangdahlem AFB in Germany. If you hadn’t made those comments, I wouldn’t even know about the US women fighter pilots. Woo Hooo on us, too. Sweet great Archery write up! well, I dont know how much you know of Persian mythology..but these is in particular this female warrior called “Gord Afarid” whose name and story is well described in “Shahname”..
Sahar, you have found one of my very all time favorite posts. I had NO idea there was a female Persian warrior called Gord Afarid. I have yet to meet a Persian/Iranian woman who is not beautiful, so I imagine she was also a beautiful warrior. Thank you for your addition. This post gets hits week after week, I think a lot of people in schools use information they find here to compile reports. Pretty cool, huh, you have just helped! Every judge and lawyer often refer to King Solomon; and we all know of a certain Queen who visited him more than once. Now, the battles and life story of the Queen of Sheba are unknown–why even her actual name is unbeknown to anyone–this is probably why she was overlooked in the above posts. There is also Jael, who delivered the deciding blow to King Sisera and helped delver Israel. Her background is also clouded, save this one act. 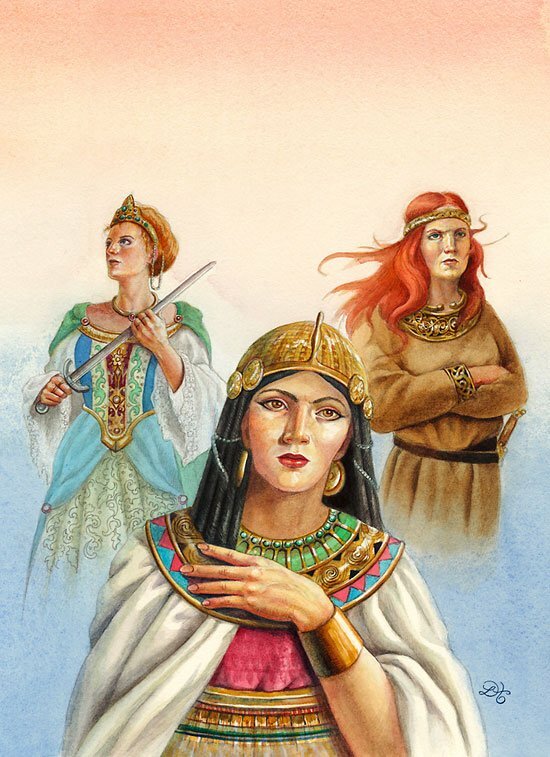 These are important historical women from ancient Middle East. Yet, so little is known about them. Maybe, in the future, we’ll learn more. Silus, thank you so much for your input and contributions. I think this is my all time favorite post, because it is still growing, still gaining information, thanks you you. There is no Arabian Gulf.. IT IS PERSIAN GULF.And it will always remain PERSIAN GULF………………………………………….. So many Ancient Persian warriors. One which you may have heard was Artemsia, a Persian navy commander during the battle of Salamis against the Greeks. King Xerxes has been quoted to say “my men have become women, and my women have become men”, as she had successfully tricked the Greeks in the battle, which led to the victory. Search up ” Women in Persia/Iran” by Kaveh Farrokh (not sure if it’s the exact title though, but google will assist you). Persia has had many female warriors. The Greeks and Romans were horrified to see women warriors in Persia (as we as Germanics and Celtics), they called the Iranian women warriors the Amazonian warriors. I have many women friends of Persian descent; they are awesome! They are women I want to have my back in a desperate situation! Thank you for your comment; this is still one of my favorite posts and one which gets readers year after year. I will look up the Persian women warrior book, thanks for a good recommendation.